Terrorist targets Jewish family in brutal stabbing and shooting attack; attacker eliminated by police. Two people have been killed and three others wounded in a terrorist attack near the Lion's Gate in Jerusalem's Old City on Saturday night, shortly after the end of Shabbat. Several of the victims are members of the same family. The 40-year-old father was hospitalized at Jerusalem's Shaarei Tzedek hospital in critical condition with multiple stab wounds, but was pronounced dead shortly thereafter. One other victim also succumbed to his wounds shortly after. The terrorist was shot and critically injured by security forces, and died of his wounds soon after. The attack began when an Arab man approached a Jewish family on their way to prayers, at which point he drew a large knife and began stabbing. The attacker then snatched a pistol from one of his victims and began firing towards tourists. One of his victims - a 22-year-old woman who was moderately wounded - ran for her life to police stationed some 50 meters away and alerted them to the attack. Police and border police forces ran towards the scene immediately, and were immediately fired upon by the terrorist. Forces responded with accurate fire towards the terrorist, fatally wounding him. The latest attack comes as Palestinian leaders continue to call for more violence against Israelis, on the heels of last week's deadly terrorist attack in which Arab terrorists murdered two parents in front of their children. 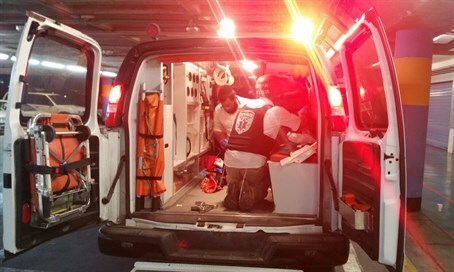 In further violence Friday, an Israeli mother and daughter were lightly injured in a rock-throwing attack close to the town of Migdalim, near Hevron. Also on Friday, a border policeman was lightly injured by Arab rock-throwers near the Lion's Gate in Jerusalem's Old City. Earlier Friday, police arrested a 25-year-old resident of the Arab neighborhood of Shuafat in Jerusalem, on suspicion of attempting to carry out terrorist attacks against border police in the city, after CCTV showed the man hurling a firebomb at security forces.